On the winter solstice, the sun is at its southernmost point in the sky in the Northern Hemisphere. The winter solstice is in full stride today (Dec. 21), which boasts the fewest hours of daylight for 2017 in the Northern Hemisphere. Although the solstice gets an entire day of recognition, it happens in an instant: at 11:28 a.m. EST (16:28 GMT), when the North Pole is at its farthest tilt of 23.5 degrees away from the sun. This position leaves the North Pole beyond the sun's reach, and plunges it into total darkness, according to EarthSky.org. At the moment of the solstice, the sun will also reach its southernmost point in the sky in the Northern Hemisphere. After that moment, the sun will stop moving southward and will begin its trek northward in the sky — hence the name "solstice," which means "sun stands still" in Latin, according to NASA. After the winter solstice, the days will begin to get longer in the Northern Hemisphere. But that doesn't mean temperatures will increase immediately. Rather, northern midlatitudes will experience the winter chill partly because they'll get about 9 hours of daylight in the weeks following the solstice, compared with the roughly 15 hours of daily sunlight they get around the summer solstice, Live Science reported in 2012. In addition, the Northern Hemisphere is tilted away from the sun, making it colder. In addition, even as the days get longer, the oceans, which moderate temperatures on land, need a vast amount of energy from the sun to heat up. 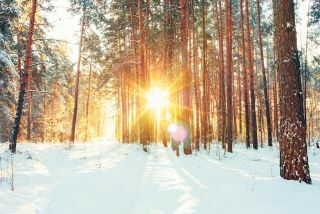 There are countless cultures that have recognized the winter solstice. The most famous is in Stonehenge in England. When the sun sets on the shortest day of the year, the sun's rays align with Stonehenge's central Altar stone and Slaughter stone, which may have had spiritual significance to the people who built the monument, Live Science reported in 2013. Across the world in Mexico's Yucatan Peninsula, the ancient stonewalled Mayan city of Tulum also has a structure honoring the solstices. When the sun rises on the winter and summer solstices, its rays shine through a small hole at the top of one of the stone buildings, which creates a starburst effect. Editor's note: This article was originally published Dec. 21, 2016. It was updated on Dec. 21, 2017.